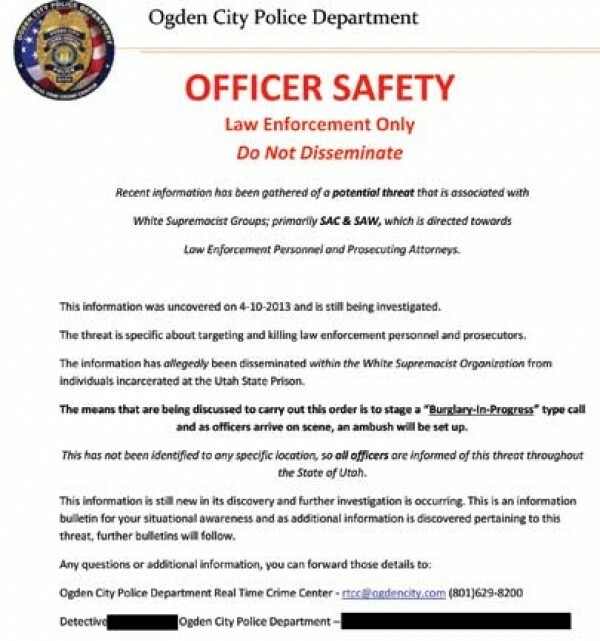 In early April, Ogden City Police Department issued a law-enforcement-only bulletin that local white supremacist groups had threatened to target and kill Utah law enforcement and prosecuting attorneys. Three months later, the credibility and severity of the threat is still unclear. The alert had its roots in three killings that made national headlines. The first was in early March 2013, when a parolee and member of the 211 Crew, an Aryan prison gang in Colorado, allegedly shot and killed the executive director of the Colorado Department of Corrections at his home. The shooter was subsequently killed in a gun battle with Texas police after a high-speed car chase. A few weeks later, a Texas prosecutor and his wife were gunned down, again in their home. Media reports linked the killings to a white supremacist gang called the Aryan Brotherhood, as the prosecutor had been part of a multiagency taskforce that had indicted several gang members, and the AB was feared to be targeting members of law enforcement who had put gang members behind bars. Eight days after the Texas couple were killed, a confidential informant, who had provided “valued” information in the past, told a northern Utah investigator that white supremacists in the Utah State Prison had ordered the killing of local cops and prosecutors. Three prosecuting attorneys that City Weekly requested to interview about the threats declined to talk on the record, citing concerns over security, but several spoke on background. The threats were linked to two Utah-based prison gangs, Soldiers of Aryan Culture (SAC) and Silent Aryan Warriors (SAW). While membership of the two gangs often overlaps, prosecutors say that SAW has replaced SAC as being a dominant presence in both the Utah State Prison and in drug-related crime in the Salt Lake Valley. Aryan gangs in Utah have long been suspected of working with Mexican cartels to distribute in the Salt Lake Valley methamphetamine produced over the border. The informant relayed that in the aftermath of the news of the Texas killings, incarcerated gang members in the Utah State Prison had decided that going after police and prosecutors “has got to be our next step,” one prosecutor recalls. “There was a discussion about taking out prosecutors, about the best way to take out cops.” Those discussions evolved into orders that gang members who’d been released from prison delivered to other Aryan sympathizers. Subsequently, the Ogden City Police Department put out a law-enforcement-restricted bulletin warning that white supremacist groups, primarily SAC and SAW, were planning to stage a burglary and, when officers arrived on the scene, ambush them. But by mid-April, fears that Aryan gangs were embarking on a nationwide campaign to kill prosecutors and police officers fizzled out when the wife of a former justice of the peace confessed to the couple’s involvement in the Texas killings. The judge had been previously convicted of theft and burglary by the prosecutors he’s alleged to have killed. In Utah, law-enforcement sources City Weekly contacted were divided as to the severity and credibility of the threat. One law-enforcement source with knowledge of the investigation into the threats says three informants—two of whom were incarcerated in different jails—each separately passed on threats by Aryan gangs to kill law-enforcement personnel. A third informant, who was not behind bars, visited a Utah prosecutor to warn him that he was targeted, one week after the first informant related the threats to an investigator in another jurisdiction. “There are 11 named suspects who are part of the plot, and many of them have very violent criminal histories,” the law- enforcement source says. Several others, however, downplayed it as, according to one prosecutor, no more than “a couple of guys high on meth talking big.” But while no arrests have been made, there was sufficient information to lead to a search warrant being executed, one prosecutor says. Indeed, the threat was taken seriously enough that not only did numerous prosecutors across the Wasatch Front procure licenses to carry sidearms, at least one well-known figure in the legal community acquired both a handgun and a bulletproof vest.